Keep your artificial grass fresh and clean - simply spray and leave. An Artificial Grass Cleaner that will battle against a wide range of algae, fungus and bacteria, ecofective Artificial Grass Cleaner cleans synthetic turf and remove odours quickly and easily. 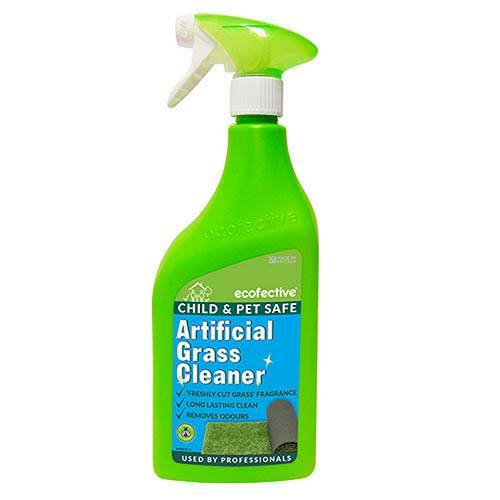 Using a unique dual-action formula which is naturally derived from surfactants and advanced probiotics (friendly bacteria), the ready-to-use solution washes away grease, grime and dirt, even mess left by pets. The cleaner has powerful deodorising qualities and will leave your garden with a freshly cut grass fragrance. Derived from natural active ingredients, it leaves millions of microorganisms to feed from any remaining dirt, providing a long-lasting effect and is safe to be used around children, pets and beneficial insects including bees. Supplied as a 1L ready to use spray. Supplied as a ready to use 1L Spray. Ideal for use on artificial grass or sports astro turf. If rain is expected do not apply – use on a dry day. Remove any large debris like leaves from the lawn, turn the trigger to the ‘ON position and apply the cleaner in a sweeping motion to cover evenly. Can also be applied as a spot treatment for recently soiled areas. Leave to dry for a few minutes, then children & pets can have access to the area. If a rogue weed appears in your artificial grass, it’s best to act fast and use a weed killer that will not harm your synthetic turf.